The four heroes of the story, left to right: Sūn Wùkōng, Xuánzàng, Zhū Bājiè, and Shā Wùjìng. Journey to the West (Traditional Chinese: 西遊記; Simplified Chinese: 西游记; Hanyu Pinyin: Xīyóu-jì; Wade-Giles: Hsiyu-chi) is one of the Four Great Classical Novels of Chinese literature. It was originally published anonymously in the 1590s during the Ming Dynasty, but since the twentieth century, it has been ascribed to the scholar Wú Chéng'ēn (1506? – 1582?). A block print of Journey to the West, Chinese, sixteenth century. Journey to the West (Xiyou-ji) is one of the Four Great Classical Novels of Chinese literature. It was originally published anonymously in the 1590s during the Ming Dynasty. There is no surviving direct evidence of its authorship, but since the twentieth century, it has been ascribed to the scholar Wú Chéng'ēn (1506? – 1582?). In the novel, Buddha instructs the Bodhisattva Guānyīn to search Táng China for someone to bring the Buddhist sutras to the East. The Guānyīn, gives this task to the monk Xuánzàng and his three disciples, who undertake an arduous journey to the West, involving 81 adventures. Journey to the West has a strong background in Chinese folk religion, Chinese mythology and value systems; the pantheon of Taoist and Buddhist deities reflects belief that are still current in modern Chinese folk religion. The novel is an entertaining adventure story, conveying moral lessons and spiritual insights, and an extended spiritual allegory in which the group of pilgrims journeying towards India represents for the individual’s journey towards enlightenment. It is also a humorous satire of Chinese society and Chinese bureaucracy. The Big Wild Goose Pagoda of Xī'ān, China. The Big Wild Goose Pagoda in Xī'ān, Shǎnxī Province, China, was both the starting and ending point of this epic journey. A statue of Xuánzàng can be seen near the right of this panorama. Journey to the West is a fictionalized account of the legends surrounding the 16-year pilgrimage of the Buddhist monk Xuánzàng (602–664) to India during the Táng dynasty, to obtain Buddhist religious texts (sutras). Xuánzàng reached India after experiencing innumerable trials and hardships. He lived there for more than a decade, studying classics of Buddhism and Indian culture at Nalanda University, then returned to China, bringing with him copies of many classic Buddhist texts which contributed significantly to the promotion of Buddhism in China. Upon his return to China, he presented the emperor with a detailed account of his travels, "Journey to the West in the Great Tang Dynasty" (大唐西域記, Ta-T'ang Hsi-yü-chi). The story of his pilgrimage was already part of Chinese folklore, poetry, and drama when Wu Ch’eng wrote it as a long and satirical novel. 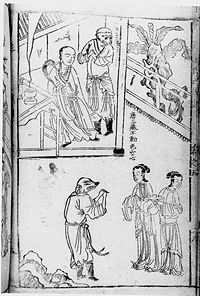 In those earlier versions, dating as far back as the Southern Song dynasty, a monkey character was already a primary protagonist. It is believed that this character originated from Xuánzàng's accounts of Hanuman, the Hindu monkey god from the ancient Ramayana epic. Elements of the Monkey legend were already evident in folklore and literature during the Yuan and early Ming Dynasties. The novel comprises 100 chapters, which can be divided into three major sections. The first, which includes chapters 1–7, is really a self-contained prequel to the main body of the story. It deals entirely with the earlier exploits of Sūn Wùkōng, a monkey born from a stone egg, who learns the art of fighting and secrets of immortality, and through guile and force makes a name for himself as the Qítiān Dàshèng (Simplified Chinese: 齐天大圣; Traditional Chinese: 齊天大聖), or "Great Sage Equal to Heaven." 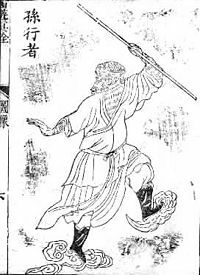 His powers grow to match the forces of all of the Eastern (Taoist) deities, and the prologue culminates in Sūn's rebellion against Heaven, at a time when he occupies a post in the celestial bureaucracy. Hubris proves his downfall when the Buddha manages to trap him under a mountain for 500 years. Following this introduction, the nominal main character, Xuánzàng, is introduced. Chapters 8–12 provide his early biography and the background to his great journey. Dismayed that "the land of the South knows only greed, hedonism, promiscuity, and sins," the Buddha instructs the Bodhisattva Guānyīn to search Táng China for someone to bring the Buddhist sutras of "transcendence and persuasion for good will" to the East. Guānyīn gives this task to the monk Xuánzàng and provides him with three protectors in the form of disciples, Sūn Wùkōng, Zhū Bājiè and Shā Wùjìng, together with a dragon prince who acts as Xuánzàng's horse mount. These four characters agree to help Xuánzàng as atonement for past sins. This section of the story relates how Xuánzàng becomes a monk (as well as revealing his past life as the "Golden Cicada") and is sent on a pilgrimage by the Emperor Táng Tàizōng, who has previously escaped death with the help of an underworld official. The third and longest section of the work is chapters 13–100, an episodic adventure story which combines elements of the quest as well as the picaresque. The framework of the story is Xuánzàng's quest to bring back Buddhist scriptures from Vulture Peak in India, but the substance is provided by the conflict among Xuánzàng's disciples and the various evils that beset him on the way. The setting of this section is supposedly the sparsely populated lands along the Silk Road between China and India, including Xinjiang, Turkestan, and Afghanistan. The geography described in the book is, however, almost entirely fantastic; once Xuánzàng departs Cháng'ān, the Táng capital and crosses the frontier (somewhere in Gansu province), he finds himself in a wilderness of deep gorges and tall mountains, all inhabited by flesh-eating demons who regard him as a potential meal, with a hidden monastery or a royal city-state here and there amid the wilds. The episodic structure of this section follows a formula to some extent. Episodes consist of 1– 4 chapters, and usually involve Xuánzàng being captured and his life threatened, while his disciples try to find an ingenious (and often violent) way of liberating him. Although some of Xuánzàng's predicaments are political and involve ordinary human beings, they more frequently consist of run-ins with various goblins and ogres, many of whom turn out to be the earthly manifestations of heavenly beings. Chapters 13–22 do not follow this structure precisely, as they introduce Xuánzàng's disciples, who, inspired or goaded by the Boddhisatva Guānyīn, meet and agree to serve him along the way, in order to atone for their sins in their past lives. Sūn Wùkōng (Simplified Chinese: 孙悟空; Traditional Chinese: 孫悟空), or Monkey, previously "Great Sage Equal to Heaven," appears right away in Chapter 13. The second, appearing in Chapter 19, is Zhū Bājiè (Simplified Chinese: 猪八戒; Traditional Chinese: 豬八戒), literally “Eight-precepts Pig,” sometimes translated as Pigsy or just Pig. The third, appearing in Chapter 22, is the river-ogre Shā Wùjìng (Simplified Chinese: 沙悟净; Traditional Chinese: 沙悟淨), also translated as Friar Sand or Sandy. The third prince of the Dragon-King, Yùlóng Sāntàizǐ (Simplified Chinese: 玉龙三太子; Traditional Chinese: 玉龍三太子) can possibly to be counted as a fourth disciple. He was sentenced to death for setting fire to his father's great pearl, but was saved by Guānyīn from execution to wait for his call of duty. 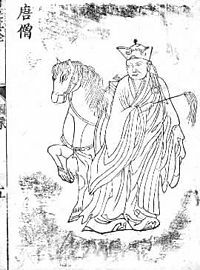 He appears first in chapter 15, but has almost no speaking role, as throughout most of the story he appears in the transformed shape of a horse that Xuánzàng rides on. Chapter 22, where Shā is introduced, also provides a geographical boundary, as the river of quicksand that the travelers cross brings them into a new "continent." Chapters 23–86 take place in the wilderness, and consist of 24 episodes of varying length, each characterized by a different magical monster or evil magician. There are impassably wide rivers, flaming mountains, a kingdom ruled by women, a lair of seductive spider-spirits, and many other fantastic scenarios. Throughout the journey, the four brave disciples have to defend their master and teacher Xuánzàng from attacks by various monsters and calamities. The book strongly suggests that most of these calamities are engineered by fate and/or the Buddha; while the monsters who attack them are vastly powerful and many in number, no real harm ever comes to the four travelers. Some of the monsters turn out to be escaped heavenly animals belonging to bodhisattvas or Taoist sages and spirits. Towards the end of the book there is a scene where the Buddha literally commands the fulfillment of the last disaster, because Xuánzàng is one short of the 81 disasters he needs to attain Buddhahood. In chapter 87, Xuánzàng finally reaches the borderlands of India, and chapters 87–99 present magical adventures in a somewhat more mundane, though still exotic, setting. At length, after a pilgrimage said to have taken fourteen years (the text actually only provides documentation for nine of those years, presumably to allow room for adding additional episodes) they arrive at the half-real, half-legendary destination of Vulture Peak, where, in a scene simultaneously mystical and comic, Xuánzàng receives the scriptures from the living Buddha. Chapter 100, the last of all, quickly describes the return journey to the Táng Empire, and the aftermath, in which each traveler receives a reward in the form of posts in the bureaucracy of the heavens. Sūn Wùkōng and Xuánzàng achieve Buddhahood, Wùjìng becomes an arhat, the dragon is made a Naga, and Bājiè, whose good deeds have always been tempered by his greed, is promoted to an altar cleanser (eater of offerings at altars). Xuánzàng (or Táng-Sānzàng, meaning "Táng-dynasty monk"—Sānzàng or "Three Baskets," referring to the Tripitaka, was a traditional honorific for a Buddhist monk) is the Buddhist monk who sets out for India to retrieve the Buddhist scriptures for China. He is called Tripitaka in many English versions of the story. Although he is helpless when it comes to defending himself, the bodhisattva Guānyīn helps by finding him three powerful disciples (Sūn Wùkōng, Zhū Bājiè, and Shā Wùjìng) who aid and protect him on his journey. In return, the disciples will receive enlightenment and forgiveness for their sins once the journey is done. Along their journey, they help the local inhabitants by defeating various monsters. Much of the story line comes from the fact that most of the monsters and demons are trying to obtain immortality by eating Xuánzàng's flesh, and are even attracted by his handsome appearance. The name Sūn Wùkōng is given to this character by his teacher, Patriarch Subodhi, and means "the one who has Achieved the Perfect Comprehension of the Extinction of both Emptiness and non-Emptiness; "he is called Monkey King or simply Monkey in English. Sūn Wùkōng was born out of a rock that had been dormant for ages in Bloom Mountains that was inhabited/weathered by the sun and moon until a monkey sprang forth. He first distinguished himself by bravely entering the Cave of Water Curtains (pinyin:Shuǐlián-dòng ) at the Mountains of Flowers and Fruits (Huāguǒ-shān); for this feat, his monkey tribe gave him the title of Měi-hóuwáng ("handsome monkey-king"). Later, he started making trouble in Heaven and defeated an army of 100,000 celestial soldiers, led by the Four Heavenly Kings, Erlang Shen, and Nezha. Eventually, the Jade Emperor appealed to Buddha, who subdued and trapped Wukong under a mountain. He was only released when Xuanzang came upon him on his pilgrimage and accepted him as a disciple. His primary weapon is the rúyì-jīngū-bàng ("will-following golden-banded staff"), which he can shrink down to the size of a needle and keep behind his ear, as well as expand it to gigantic proportions (hence the "will-following" part of the name). The staff, originally a pillar supporting the undersea palace of the East Sea Dragon King, which he pulled out of its support and swung with ease, weighs 13,500 pounds. The Dragon King, not wanting him to cause any trouble, also gave him a suit of golden armor. In addition, he has devoured the peaches of immortality and three jars of immortality pills while in Heaven, and endured an ordeal in an eight-trigram furnace which gave him a steel-hard body and fiery golden eyes, making Wukong the strongest member by far of the pilgrimage. Besides these attributes, he also has the ability to pull hairs from his body and blow on them to transform them into whatever he wishes (usually clones of himself to gain a numerical advantage in battle). Although he has mastered 72 methods of transformation, he is not restricted to only 72 different forms. He can also do a jīndǒuyún ("cloud somersault"), enabling him to travel vast distances in a single leap. Wukong uses his talents to fight demons and play pranks. However, his behavior is checked by a band placed around his head by Guanyin, which cannot be removed by Wukong himself until the journey's end. Xuanzang can tighten this band by chanting the Tightening-Crown spell (taught to him by Guanyin) whenever he needs to chastise him. Wukong's child-like playfulness is a huge contrast to his cunning mind. This, coupled with his acrobatic skills, makes him a likeable hero, though not necessarily a good role model. His antics present a lighter side during the long and dangerous trip into the unknown. Zhū Bājiè ("Pig of the Eight Prohibitions") is also known as Zhū Wùnéng ("Pig Awakened to Power"), and given the name Pigsy or Pig in English. Once an immortal who was the Tiānpéng-yuánshuǎi ("Field Marshal Tianpeng") of 100,000 soldiers of the Milky Way, he drank too much during a celebration of gods, and attempted to flirt with Cháng'é, the beautiful moon goddess, resulting in his banishment into the mortal world. He was supposed to be reborn as a human, but ended up in the womb of a sow due to an error at the Reincarnation Wheel, which turned him into a half-man, half-pig monster. While living in Yúnzhan-dòng ("cloud-pathway cave"), he is commissioned by Guanyin to accompany Xuanzang to India and given the new name Zhu Wuneng. However, Wuneng's desire for women leads him to Gao Village, where he poses as a normal being and takes wife. Later, when the villagers discovered that he is a monster, Wuneng hides the girl away. At this point, Xuanzang and Wukong arrive at Gao Village and help subdue him. Renamed Zhu Bajie by Xuanzang, he consequently joins the pilgrimage to the West. Zhu Bajie is characterized by his insatiable appetites, and is constantly looking for a way to avoid his duties, but is always kept in line by Sūn Wùkōng. 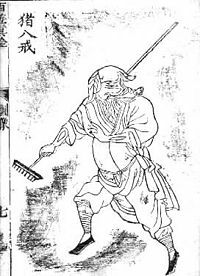 His weapon of choice is the jiǔchǐdīngpá ("nine-tooth iron rake"). He is also capable of thirty-six transformations (as compared to Wukong's 72), and can travel on clouds, but not as fast as Wukong. However, Bajie is noted for his fighting skills in the water, which he uses to combat Sha Wujing, who later joins them on the journey. Shā Wùjìng (literally meaning "Sand Awakened to Purity"), given the name Friar Sand or Sandy in English, was once the Curtain Raising General, who stood in attendance by the imperial chariot in the Hall of Miraculous Mist. He was exiled to the mortal world and made to look like a monster because he accidentally smashed a crystal goblet belonging to the Heavenly Queen Mother during the Peach Banquet. The now-hideous immortal took up residence in the Flowing Sands River, terrorizing the surrounding villages and travelers trying to cross the river. However, he is subdued by Sūn Wùkōng and Zhū Bājiè when the Sānzàng party comes across him, and they include him in their pilgrimage to the West. 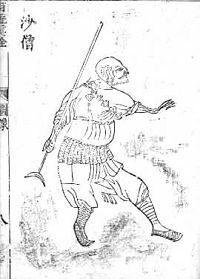 Shā Wùjìng's weapon is the yuèyáchǎn ("Crescent-Moon-Shovel" or "Monk's Spade"). Aside from that, he knows 18 transformations and is highly effective in water combat. He is almost as strong as Bājiè , and is much stronger than Wùkōng in water. Bājiè can beat Wujing in a test of endurance, and Wùkōng can beat him out of water. Shā Wùjìng is known to be the most obedient, logical, and polite of the three disciples, and always takes care of his master, seldom engaging in the bickering of his fellow-disciples. Ever reliable, he carries the luggage for the travelers. Perhaps this is why he is sometimes seen as a minor character. Wùjìng eventually becomes an Arhat at the end of the journey, placing him at a higher level of exaltation than Bājiè, who is relegated to cleaning every altar at every Buddhist temple for eternity, but is still lower spiritually than Wùkōng or Sānzàng, who are granted Buddhahood. A Chinese Odyssey by Stephen Chow. A Chinese Tall Story: 2005 live action movie starring Nicholas Tse as Xuánzàng. Heavenly Legend: A 1998 film by Tai Seng Entertainment starring Kung Fu kid Sik Siu Loong is partially based on this legend. Monkey Goes West: The Shaw Brothers's 1966 Hong Kong film (Cantonese: Sau yau gei. Also known as "Monkey with 72 Magic"
Journey to the West: A Chinese 1986 live action series and some other adaptations. Journey to the West: A two-part television series produced by Hong Kong studio, TVB. Monkey: The well-known 1970s Japanese television series based on Journey to the West translated into English by the BBC. The Monkey King: Sci Fi Channel's TV adaptation of this legend, also called The Lost Empire. Saiyūki: A 2006 Japanese television series starring the SMAP star Shingo Katori. Journey to the West: The Musical: A stage musical which received its world premiere at the New York Musical Theatre Festival on September 25, 2006. Monkey: Journey to the West: A stage musical version is currently in development by Damon Albarn and Jamie Hewlett. It premiered as part of the 2007 Manchester International Festival at the Palace Theatre on June 28. All links retrieved June 12, 2018. Monkey - Great Sage equal of Heaven - fansite. Journey to the West – Freeware complete English text version in PDF format (2.56MB). Journey to the West – Comprehensive and detailed website with in-depth information about Journey to the West. Story of Sun Wukong and the beginning of Journey to the West – with manhua. Complete novel – in Simplified Characters (utf-16 encoding). Monkey Heaven – A site with extensive information on the television adaptation, Monkey Magic. History of "Journey to the West"
This page was last modified on 12 June 2018, at 14:59.